An unexpected consequence of the constantly improving performance associated with today’s scientific research tools is the explosion of data that can rapidly overburden researchers working to solve some of the nation’s most complex problems. To make the most of the data and enhance the overall discovery process, scientists need to spend more time finding answers and less searching for files, orchestrating data movement or tracking metadata. 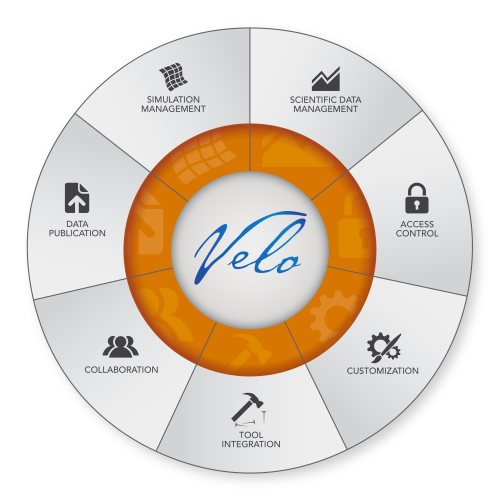 Velo, a customizable, reusable and collaborative knowledge management system based on commercial-grade, open-source technologies, is designed explicitly for managing scientific work over the entirety of a project’s life cycle. Already deployed operationally in several U.S. government agencies, Velo is the product of more than a decade of development and expertise. The result is a scalable total data management platform that can be tailored and launched to its sites within weeks. Velo shares the Open Source goal to develop applications faster with higher quality components. We want collaborative science projects to focus on their science, not building another software framework. We embrace and celebrate open exchange, collaborative participation, rapid prototyping, transparency, meritocracy, and community development. Velo source code is available on the public mirror (coming soon) for download.